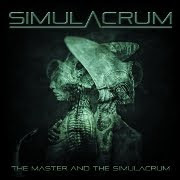 RockUnitedReviews: SIMULACRUM: "Master And The Simulacrum"
In the summer of last year I reviewed the promo EP of these Finnish prog metsl rockers. The four songs on that EP can of course also be found on this full length debut album, so I will only review the 4 new songs being: Hammerhead, Flagiston, Autumn Rain and Genesis Part 1. Hammerhead features a typical prog metal intro and later on evolves into a rather complex or should I say chaotic song. The guitar solo is quite enjoyable but the high-pitched vocals tend to get on my nerves a bit. Flagiston is an instrumental song filled with lots of piano and organ passages, but also with some amazing melodies and guitar parts; this is probably my favourite song on the album. Autumn Rain is a sort of ballad with a rather boring - read: too long - piano intro and sometimes very irritating vocals. On the other hand I really do like the orchestral part and the guitar solo. "Genesis Part 1", the last song on the album, also the longest one, is again a superb prog metal piece with all the necessary ingredients and do check out the excellent guitar solo! Resume: this is a great prog metal album and if you love Dream Theater and Symphony X you really should buy this album. However I feel/think that the vocals are sometimes too dominant and singer Niklas Broman strains his vocal chords too much resulting in rather over the top vocal passages in songs like Autumn Rain or Hammerhead. But the future looks great for these ytoung Finnish rockers!